Methinks he's gonna hear about that one. Yeesh. So, someone fill me in if I'm missing anything. A bunch of internal NHL emails about concussions were leaked and are being posted on Twitter (and probably elsewhere) for everyone to see. There was one where Bobby Mac appeared to be asking Colin Campbell to give out a suspension to Corey Perry for a hit on Cheechoo. Largely, they seem to indicate that the NHL was blasé about concussions, even dismissive. That's an amazing email to read! I wonder what Bobby Mac is going to say about these emails. He's going to lose a lot of face with the players over this one particular email, and it must just be the tip of the iceberg. Colin Campbell referring to Doug Wilson as "Doug Whine Wilson" is amazing too. Like, that's a high-ranking NHL official showing bias against a GM. Yikes. tim1_2 wrote: I wonder what Bobby Mac is going to say about these emails. He's going to lose a lot of face with the players over this one particular email, and it must just be the tip of the iceberg. 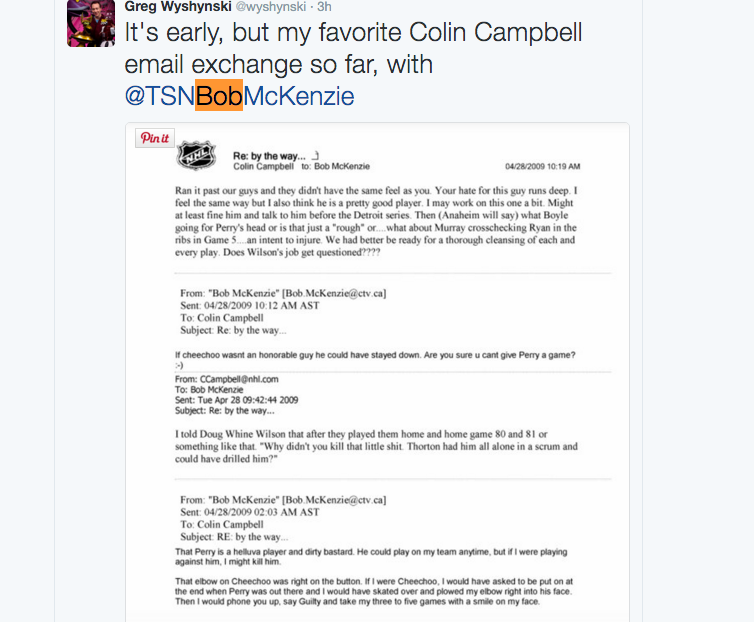 Colin Campbell referring to Doug Wilson as "Doug Whine Wilson" is amazing too. Like, that's a high-ranking NHL official showing bias against a GM. Yikes. Good thing MacKenzie is nearing retirement anyway. I can only imagine what will be discovered in the rest of the emails. Just goes to show, be careful what you send from ye ol' corporate email address. How many games for Kane, I wonder. And now Dreger is talking about how the media doesn't have any sway with NHL teams...interesting. If anyone sees any comments from Dreger or Bobby Mac or anyone else about the unsealed NHL emails, post it here!! Just type in "nhl.com" as one of the search terms since all the NHL e-mails use that domain. Then add the name of someone like "Campbell" or "Bettman" or "MacKenzie". Have fun. Mike Van Ryn was a "woos (wuss?) and is soft" according to Colin Campbell. Collie Campbell comes across as someone who would have been fired, long ago, from any place other than the NHL Old Boy Club. I was just thinking that. He's an embarrassment. I don't see that in the emails you posted. Was it from a different one?